We're used to store exclusives, but that usually means Toys Я Us or Kmart or something. It's still a bit weird when the store a toy is exclusive to is Amazon. In advance of the release of GI Joe Retaliation [HA! --ed. ], Amazon offered an exclusive four-figure boxset of movie characters. At the same time, they also offered a set of figures based on the late, lamented Renegades. 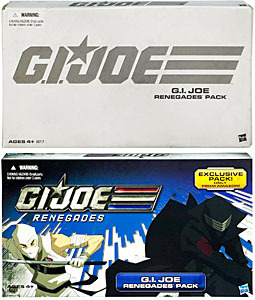 The set comes in a black and white box featuring art of Snake-Eyes and Storm Shadow (of course) on the back. When you open it, you find a second box with color art of Snake-Eyes and Storm Shadow (of course) on the lid. The back has more art of the four characters in the set - which means even more pictures of Snake-Eyes and Storm Shadow (of course). Inside is a plastic tray, with each of the figures resting in its own slot. 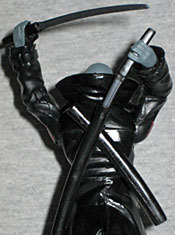 The first figure is, big surprise, Snake-Eyes (of course). 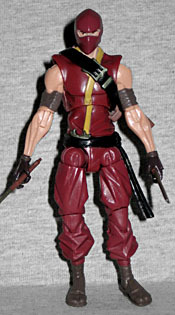 Snake-Eyes is a mysterious ninja who helps Scarlett and the other Renegades. He never speaks or shows his face, but he does reveal himself to be an extremely powerful ninja. He was trained by the Arashikage ninja clan, the same clan that trained his sworn enemy, Storm Shadow, the Cobra ninja mercenary. Wow, this is an entirely new figure! Not a single piece of him is taken from the previous Renegades Snake-Eyes. There were rumors, back when Renegades was still in production, that Hasbro wanted to do "animated" style figures that would have more closely matched the character models, but that clearly had been dropped by the time the toys were revealed. Well clearly some level of work had already gone into sculpting and tooling, because that's what this figure gives us. 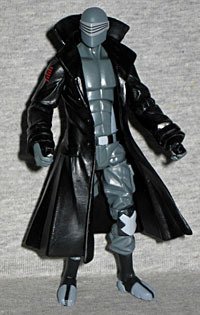 Snake-Eyes is wearing the trenchcoat that was often a part of his ensemble on the show. His collar is turned up, and the sleeves are thick and wrinkly. His torso is sleek and angular, really matching Clement Sauve's character designs. It doesn't stop there, either: the pants look more like the character model's, the kneepads are the appropriate "X" style and while the armor on his feet may look weird, it and the skinny shins are exactly what the cartoon showed us every week. The only way in which this figure doesn't match the animation is the paint. Rather than being black, like he should be, he's gray. It's not even very dark, either! His suit should be almost the same color as his coat, but it's not. The visior works being pale, but the rest of him really needs to be repainted. 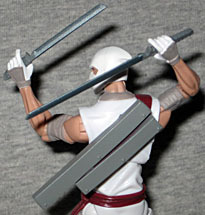 At least he gets Arashikage symbols on his shoulders. His accessories include two swords, and a two-piece scabbard. It's actually two separate scabbards, but one has a ring that you can slide the other through. A hole in his coat allows you to plug them in place, and both hands are molded to hold the weapons. Remember, when you're drawing a sword from your back, you want the sharp side to be up; otherwise you'll be holding it wrong. And if you put the two sheaths together backwards, they're have a really wide, wonky spread, so don't do it. They don't lock together, so it's an easy fix if you do. When this set was revealed, we thought Duke was identical to his mass-market release, but that certainly isn't the case - in fact, the only pieces that are the same are his vest and his head, and both of those have been given new, lighter paint apps to make them look more animated. The upper body comes from Law, so no longer do we have to deal with huge, bulbous wrists, and the legs are from the Cobra Trooper, giving him bigger kneepads (which is truer to the animation). It's a good combo, and improves greatly upon the existing figure. Really, Duke is the worst figure in this set, and he's still pretty awesome, so you know we're in for a treat. Hasbro must have known that Duke was going to be the figure in this set that nobody cared about, because they gave him an entire arsenl of weapons. Or maybe it had more to do with him being the only figure that didn't get any new tooling. Whatever the case, he has two rifles, two "Duke" pistols and two "Scarlett" pistols. It's enough to arm an entire squadron! Storm Shadow trained in the Arashikage ninja clan with Snake-Eyes. When his ninja master was murdered, Storm Shadow blamed Snake-Eyes and vowed to get revenge. He works for Cobra as a ninja assassin and is also a bodyguard for Cobra Commander. Okay, wow - this figure is entirely different from what we saw on the cartoon! While the previous figure tried to split the difference between the show design and the classic Real American Hero look, this one is 100% new design. It's still done in the aborted animated style, but the costume isn't what we saw on the show - at least, not in Season 1. Who knows where Season 2 would have gone, if the show had been treated fairly. The sculpt has a definite "animated" feel to it - think of the way Clone Wars toys look when compared to the normal Star Wars figures. It's easiest to see on his head: while most of the clothes are baggy enough to hide any animated influence, his mask is smooth, simple, and has an exaggerated point in the back. But again, not what was in the show. 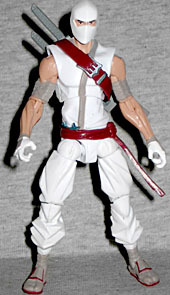 Storm Shadow is wearing a sleeveless tunic and large pants, and has a red belt and sash around his chest. There are two ninja stars sculpted into his belt. He has cloth wrapped around his upper arms, white and grey gloves, and shoes that seem to be part boot, part sandal - complete with a groove for his big toe! His skin is darker than expected, but he does have the Arashikage tattoo on his right arm (though the placement is a little strange). Tommy's accessories are two swords and a backpack to hold them. It's not much, but like Snake-Eyes above, the point of this figure was the previously unused tooling, not the things he comes with. That said, the swords are new, with wrapped hilts, small hooks in place of a crossguard, and silver apps on the blades. Nice pieces, honestly. Cobra Ninja Vipers are no less than 10th level black belts in karate, jujitsu and kung fu. These villains are extremely obedient and always carry out their orders to the letter. They function as covert subversives who can "persuade" anyone to do their bidding by entrapping the person in one of their patented martial arts maneuvers. Storm Shadow has personally trained these deadly warriors and enlisted them in service to Cobra Commander. The Ninja Viper is a new characer for this set. New to Renegades, not to GI Joe in general - the name has been in use since 1992. Rather than being bright teal, however, he's done in a deep red with brown socks, gloves and arm wraps, a black sash and belt, and gold trim on his shirt. This is a very nice look, even if it reminds us more of the Red Ninjas (traitorous Arashikage who worked as mercenaries) than the Ninja Vipers we've seen before. 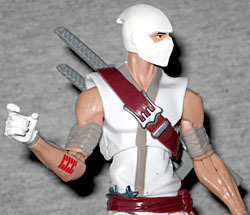 The figure is a repaint of Storm Shadow, as you'd expect, and comes with the same accessories. 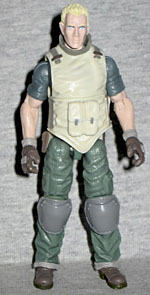 The articulation on these animated-style figures is different from the GI Joe standard. A lot of it is the same - balljointed head, swivel/hinge shoulders and elbows, swivel wrists, balljointed torso, double-hinged knees and swivel/hinge ankles - but the hips are more like a Marvel release than any other GI Joes. Rather than metal balljoints deep in the hips like we're used to, these figures have the same "ball" hips Marvel Legends used to get all the time. You know, a swivel/hinge hip and a swivel thigh, and the actual sculpt is round? Yeah. It's not what we're used to, but it works. This set was a total surprise when it was announced: the animated style figures were nothing but a rumor, with not even a single sculpt being seen until Amazon published the pictures of what this set came with. Now that we see what might have been, it's even sadder that the Renegades toys got shorted so badly. Imagine if we'd gotten the full crew in this style, instead of the hybrid we actually got. Of course, imagine if we'd gotten Roadblock, the Baroness, Destro and all the other missing characters, too. Even if you got Duke, Snake-Eyes and Storm Shadow, this set is definitely worth the purchase, because none of them are truly repeats.